Many Veterans are deployed to combat zones, but after they return home some of them are engaged in a battle with mental duress, drugs, unemployment, homelessness, and the criminal justice system. The Miami VA recently held a “Mental Health Summit” at the TC Doherty Auditorium to bring community partners together to network on solutions to finding better healthcare for mental health patients. “Mental health is the primary function of the VA,” said David J. VanMeter, FACHE, Interim Director Miami VA Healthcare System. “While everybody’s trying to figure out what to do, we already have one of the best procedures in place. One such feature is Fast Track where Veterans that need psychiatric assistance are diagnosed and in some instances are given prescriptions within minutes of seeing the doctor. VanMeter also says that suicide is a top priority, and the leading cause of deaths in the United States. “More people die from suicide than war,” said Gloria Lewis, DNP (c), RN, Suicide Prevention Coordinator, Lead. “Suicide doesn’t only pertain t Veterans, it’s a societal issue.” According to Lewis the VA has the largest integrated suicide prevention program for example; Veterans that are discharged with less than honorable from the military are now being able to receive treatment for their mental health concerns. During World War 1 there was no mental health treatment for Veterans – but now in the 21st Century, young combat Veterans face multiple challenges, and are now confronted with Post Traumatic Stress Disorder (PTSD). The VA has been on the forefront, when it comes to researching PTSD. He says that 60 percent of Veterans avoid treatment, because of the stigma that’s associated with mental health. Because of their disorder they end up living on the streets and catching misdemeanor charges where they go to jail and don’t get treatment. Before he became a judge, Steve Leifman was asked to serve on a committee that toured a state hospital, and what he witnessed there was appalling, because he grew up in a middleclass neighborhood, and had never been exposed to anything bad. He says one patient was in bad shape, because he was restrained in a straitjacket, and covered in his own feces, and the guard was washing him down with a hose. 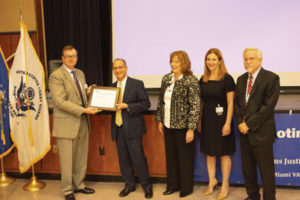 “The irony of all of this is that the guy wasn’t even psychotic,” said Featured speaker Judge Steve Leifman, Associate Administrative Judge, Miami-Dade County Court, Eleventh Judicial Circuit of Florida. Due to his expertise in the areas of criminal justice and mental health, Judge Leifman has served on local, state and national committees that work toward system transformation. People with mental health disorders are more prone to being incarcerated, and he says that some Veterans at some point will likely interface with the law. Treatment Court is a hybrid of the drug and mental health court models, and the Veterans that participate are strictly volunteers, and can opt out at any time. James Brooks, 68, a Vietnam era Army Veteran that attended the summit, says that he’s currently undergoing treatment for anxiety and depression at the Miami VA.